Two different types of devils collide in the peeks of the Tasmania outback in Syfy original thriller, “Tasmanian Devils”. Giant Tasmanian devils get territorial when a group of daredevil base jumpers invade their space and try to kill them. “Tasmanian Devils” stars Danica McKellar (The Wonder Years) who plays a crime solving park ranger, and Olympian medalist, and former “Dancing with the Stars” competitor Apolo Ohno who plays one of the base jumpers. Apolo stated that working in green screen was a different type of experience for him, “I’ve done green screen before on a commercial, but not in this nature.” Apolo said that his career goals is that he’d like to pursue broadcasting. He currently shares his fitness knowledge by going on city tours. His most recent included forty-six cities. Their favorite shows to DVR are – for Dancia: The Newsroom, The Good Wife, Mad Men, and Dancing with the Stars. She said she watched when Apolo competed on “Dancing with the Stars,” and attended the season finale. For Apolo, his shows to DVR are: NCIS, Vegas, and Dancing with the Stars. They are also very avid users of Twitter. 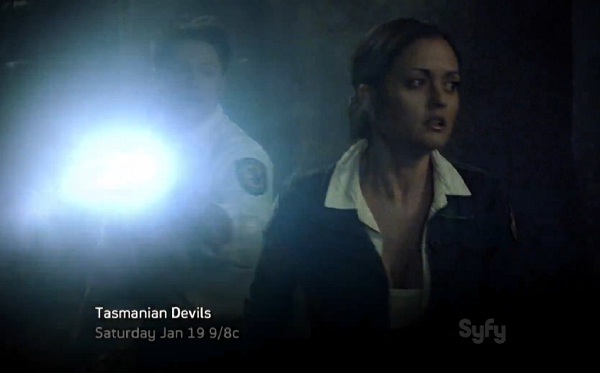 Fans can watch them battle Tasmanian Devils on Saturday, June 19 at 9pm on Syfy. SPOILER ALERT: Apolo fans, make sure not to miss the beginning of the movie.